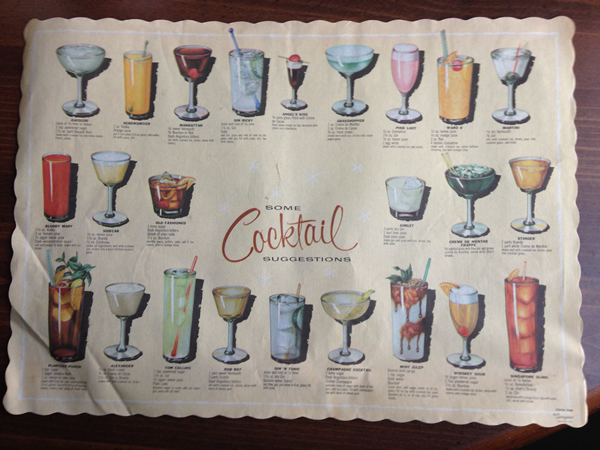 This placemat is from the 1950's featuring recipes for these classic cocktails: Daiquiri, Screwdriver, Manhattan, Gin Ricky, Angel's Kiss, Grasshopper, Pink Lady, Ward 8, Martini, Bloody Mary, Sidecar, Old Fashioned, Gimlet, Creme De Menthe Frappe, Stinger, Planters Punch, Alexander, Tom Collins, Rob Roy, Gin 'N Tonic, Champagne Cocktail, Mint Julep, Whiskey Sour, and Singapore Sling. This placemat was printed by Springprint of Springfield, OH. Singapore Sling juice of 1/2 lemon, 1/2 oz. Benedictine, 1/2 oz. cherry Brandy, 2 oz. Gin: decorate with orange slice, top with soda, stir, serve with straw.